Kellogg’s Finally Getting in on the Gluten-Free Game? Not only is it the most popular blog post on GlutenFreePDX.com, but it’s an issue that has frustrated me for quite a while! Writing back last April, I investigated Kellogg’s gluten-free offerings, and found a staggering ZERO options. This from a major purveyor of cereals, granola bars and other breakfast items that would most certainly benefit from a diverse array of offerings. 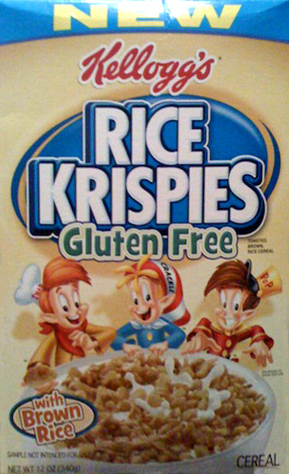 Perhaps because of public frustration, perhaps because General Mills has capitalized on Kellogg’s poor decision-making, word is that the ‘big K’ is finally getting on the Gluten-Free bandwagon. Kellogg’s is expected to release a line of cereals catering to the gluten-free audience in the next six months or so, according to sources. This includes the classic Rice Krispies, this time formulated with brown rice, and, like General Mills’ Chex, most likely using brown rice sugar or molasses instead of barley malt. Will this mean that favorites like Crispix will also get a re-formulation? Let’s hope so. I haven’t been able to eat that old favorite for years! So, look forward to a trip down the cereal aisle in the near future that isn’t quite as insulting! And thanks to public pressure and competition for getting Kellogg’s attention! This entry was posted in Cooking, Culture, Health, News, Website and tagged box cereal, breakfast, cereal, Chex, Crispix, Crispix gluten free, General Mills, gluten free cereal, Kellogg's, Kellogg's gluten free, Kellogg's news, Kellogs, news, Rice Krispies gluten, Rice Krispies gluten free, scoop on February 28, 2011 by glutenfreepdx. Glad to hear about this. I have been missing out on a childhood cereal. Will I go back to it? Maybe, but it is nice to have more choices! I miss my Crispix!!!!!! They should also start eliminating the BHA and BHT or any other preservatives from their products. Just asked the UK arm of Kellog’s when they’re going to introduce it over here. I can get some but they aren’t nice, just like eating paper! Also twice as expensive.